I felt like getting a little fancy this month, hence the tangerine blueberry waffles. Add the nutmeg and cinnamon to your waffle recipe’s dry ingredients; proceed with recipe. After the wet and dry ingredients have been combined, gently fold in the tangerine zest. Spray waffle iron with cooking spray, then ladle in batter. 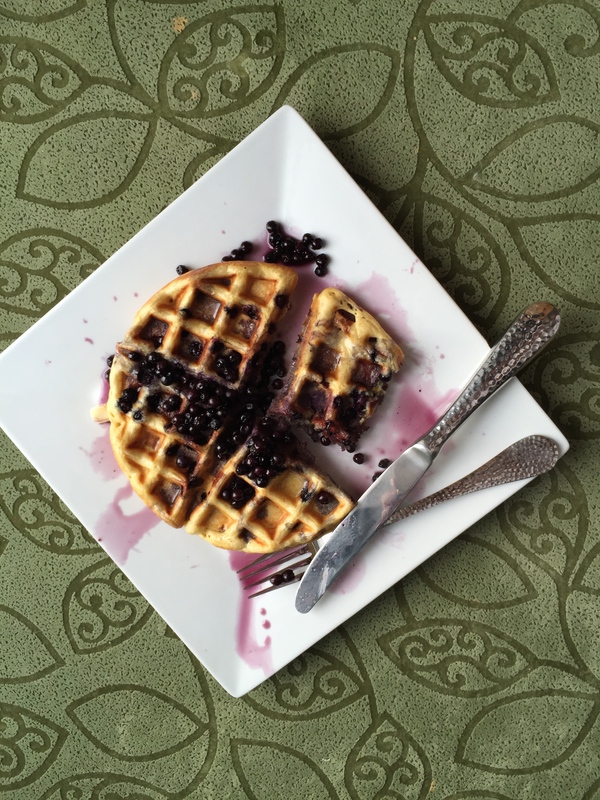 Sprinkle batter with a few tablespoons of blueberries, then close the iron and allow waffles to cook. Repeat until all the batter has been used (I keep my waffles warm in a 300 degree oven; this also keeps them crisp). Place leftover blueberries in a bowl and add some maple syrup. They shouldn’t be too wet, but have enough liquid to add some moisture to the waffles (see pic above). Heat on the stove or in the microwave until warm and serve with the waffles. If you really want to up your game, you can slather your waffles with with orange maple butter, too.